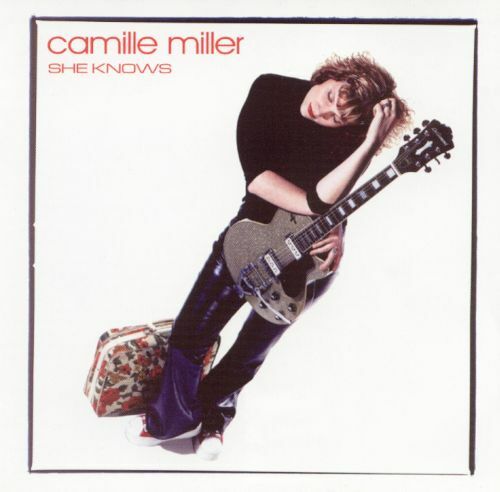 The debut solo album from Canadian singer songwriter Camille Miller is a twelve track recording entitled She Knows (Socan (Canada) CMCD2, 2001). Musical Discoveries' readers will recall Camille's contribution to the track "Lost" on the Balligomingo EP (review). Visit Camille's website for a complete biographical sketch. Camille provides lead vocals, guitars, percussion and keyboards to the project and is supported by her partner Nick Hagar (guitars and keyboards), Douglas Elliott (bass, loops, guitars, vocals, keyboards) Tina Jones (backing vocals, trumpet and percussion, Craig Northly (guitars) and Pat Steward (drums). Camille's vocal work can be most closely compared to Maryanne Marino of November Project (now disbanded) and Karin Bergquist of Over The Rhine (review). She Knows presents a broader perspective of Camille Miller's work than the brief preview found on the Balligomingo album. Material ranges from rock-n-roll ("I Always Will," "Dry," "Sugar Mountain," "Intensities") to ballads ("I Love You" and "She Knows") and from the bluesy ("Great Expectations," "Mississippi") to R&B textures ("Bird on a Rooftop," "Soul Feed," "Understand"). Camille's evocative vocals are equally delightful across the landscape. We were most reminded of Maryanne Marino (November Project) in the deeply contrasting textures of "I Love You" which varies from hearfelt ballad to soft rocker and the lush harmonies of the highly accessible "Naive." Camille's vocal work in the blues/R&B crossover "Understand" is highly notable, perfectly complimented by supporting harmonies and instrumental arrangements. The album concludes with the stunning soft rock number "Intensities," where instrumental and vocal arrangements perfectly compliment each other. Clearly worth a journey, especially for those that have enjoyed the work of November Project, Over The Rhine and Balligomingo, Camille's debut album She Knows is a very nice listen!